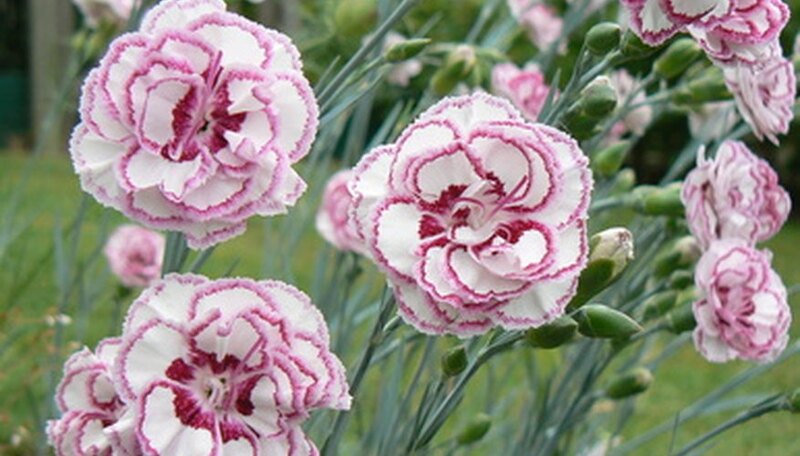 Carnations, or Dianthus, are fairly hardy, short-lived perennial flowers. Prized for their intricate flowers, carnations usually come in white, pink or red hues, but there are some varieties that are more lavender or orange. Carnations are sometimes referred to as annuals, but they aren't true annuals as they do not complete their life cycle in a single year when cared for correctly.. Most carnations live for two to three years before they require replacing, so overwintering the plants properly ensures they live to their full life span. Snip off the dead flowers and any dead or damaged foliage with a sharp set of shears in fall prior to the first frost. Remove all the dead and fallen plant matter from the bed so that diseases do not overwinter in it. Lay a 4-inch layer of mulch over the carnation bed after the first hard frost in fall. Use straw or pine boughs, as these offer protection from winter cold and help maintain the soil temperature, which prevents frost heave to the roots. Water the bed as needed to keep it slightly moist throughout winter when the ground is not frozen. In areas with mild winters, carnations may continue to bloom all winter. Remove the mulch in spring when the carnations begin actively growing again. Fertilize with a balanced fertilizer, such as 10-10-10 analysis, at the rate recommended on the fertilizer label. This encourages fresh, healthy growth from the flowers. If rabbits are a problem in your area, pine boughs discourage the pests from eating out of the carnation bed. Potted carnations can be brought indoors and kept in a sunny window throughout winter. Make sure to place them in a warm room and deadhead them often so they bloom at their best.